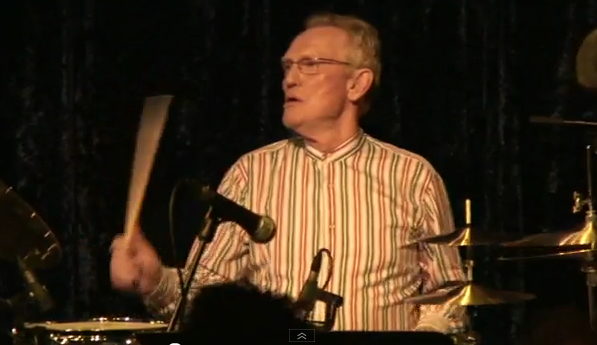 Saw Ginger Baker’s African Jazz Confusion the night before last at Ronnie Scott’s in London [I had made a longer post, but it was trashed by WordPress]. Suffice to say a great experience: with Abass Dodoo (Ghana; can’t wait to see him again somewhere) on African percussion, Alec Dankworth on bass (great musician, wonderful rhythmic and melodic sensibility) and Pee Wee Ellis (a legend in his own right – ex-James Brown, Van Morrison, many others) on sax. I love Ginger Baker’s style – his rolling, bounding river of beats just goes on and on, giving real movement and emotion to the music. This isn’t esoteric jazz or academic jazz drumming, this is something that taps into an underground river of rhythm and makes you want to get up and move, and start hitting some drums yourself. Younger ‘musicians’ and bands take note. Every so often I walk over the river to the famous (among Jazz & eclectic music-heads in London at least) Bulls Head in Barnes. Every time I think I am going to see some small possibly interesting gig in the 100 or so seat jazz room. And every time I am blown away by quality, and I think, hm, this should be a 1,500 seat gig. London is funny like that. There are these strange places where hardly any people can fit, and superstar quality just turns up on any night of the week.